12 Inch LCD writing board surface is easy to clean and maintain. This is made to be safe for your kids and is specially as a protection for the eyesight. It’s Eco-friendly, and saves millions of papers that scatter in the landfill at the same time as it saves your money. It's crafted with the safest and durable material in the market, which is the strong ABS and soft LCD that will never break easily or wear out. It has been designed with a stylus holder. Good gift choice for your kids. 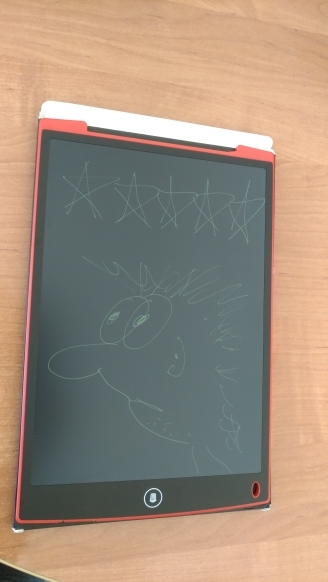 LCD Writing Drawing Tablet for Kids - Replacement for the paper and pen, to writing and doodling for kids. To communicate with others for the person who is unable to talk or deaf. To record your flashed ideas, To leave message for family. One Delete Button to Erase - Touch the button on the top of the board to erase the image and words, then get a blank board to write and draw again. Legible Writing - The LCD display can sense the pressure from the stylus and displays the thickness accordingly, no backlight to protect the eyes. Ultra Thin and Lightweight - It's slim profile makes its very easy to carry around. really super tablet, 2 come.